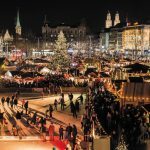 Switzerland’s largest natural ice skating venue is open. Lac de Joux in the Jura in the canton of Vaud has frozen sufficiently to allow ice skating. The lake, which is Switzerland’s largest above 1,000 m, covers 9.5 km² and is relatively shallow, reaching a maximum depth of only 32 m.
It lies in a microclimate where temperatures often drop sharply in winter. Overnight temperatures are expected to go as low as minus 11 during the week according to Meteo Swiss. Only part of the lake’s surface is open to skaters. According to the local tourism office, it is very important to stay within designated skating areas. From the photograph above, posted by the Tourism Office, it is clear that only a portion of the lake’s surface is frozen. The video below was taken on 20 January 2017. Click here to view the webcam to get a realtime view of the lake. Unfortunately I find their website a little vague, perhaps someone can help me understand a couple of things: Which train stop is the best for accessing the ice skating? Secondly, where we can rent skates? Their website says “Cordonnerie Mouquin, le Sentier” but I’m not sure where that is exactly. I agree, it’s vague. This link might help, looks like it’s at the Les Charbonnières end. See page 2 of the link!